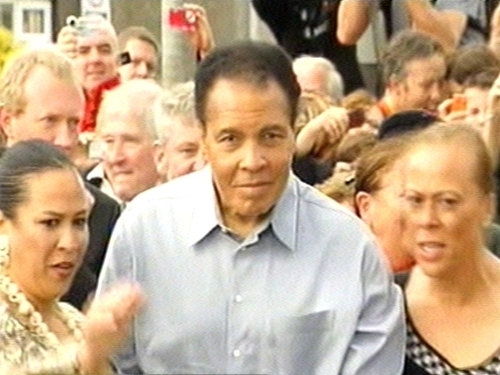 Ennis came to a standstill this afternoon with the arrival of Muhammad Ali for a host of events organised in his honour. At a civic reception in the Co Clare town, the three-time World Heavyweight Champion was made the first Honorary Freeman of Ennis. The 67-year-old was visiting the birthplace of his great grandfather, Abe Grady, who left the town in the 1860s. As an overwhelmed Ali accepted the honour, his wife Yolanda 'Lonnie' revealed his celebrated defiance with a declaration to return, despite medical advice against travelling. 'Now that we know Muhammad is an Ennis man, we will be back,' she said. Thousands of fans, spanning generations, had packed into the town's main square for hours before the civic reception was broadcast on a huge screen. Lonnie announced that her husband, who has been battling Parkinson's Disease for 25 years and had never before visited Ennis, was overwhelmed by the experience. More than three decades after he famously claimed to have 'even cancelled the rain' for his Rumble in the Jungle against George Foreman, it appeared he had pulled off the same stroke in Co Clare. After weeks of summer downpours, threatening rainclouds cleared almost within minutes of Ali being spotted touching down at Shannon Airport at around midday. Imelda O'Grady, a distant cousin who embraced the boxing legend as he arrived at Ennis Civic Chamber, was in no doubt about the force behind this freak outbreak of sunshine. 'Look, the sun's come out - it's shining down on him,' she said. 'When he saw his relations he was delighted. I think he was emotional - by God, I was certainly emotional,' she said. So too were the thousands more who thronged Turnpike Road, the homeplace of Mr Grady, who emigrated to the US in the 1860s and married a freed African-American slave. The former boxer, renowned as a civil rights champion, astonished his fans when he unexpectedly alighted from a people carrier to unveil a plaque at his ancestor's house. As crowds cheered 'Ali, Ali', he turned and - in an impromptu throw-back to his days in the ring - gave brief a shadowboxing cameo. Tight security by handlers had kept Ali at a considerable distance from the public during his brief Irish visit. He left Co Clare tonight in a private jet on his way to his home in Kentucky.